Can you tell which feathers need to be clipped? Clipping a parakeet's wings can be intimidating. While you don't want to clip too much, or clip the wrong feathers entirely, you also don't want your bird to fly away and injury herself. Learning which feathers to trim and how often to clip them will keep your bird safe. The most basic reason to clip a parakeet's wings is to prevent her from flying away from you, which she may do initially since you're a complete stranger to her. This small bird can achieve flight quite easily, though flying around your home can result in injury -- crashing into a window or mirror, for example. Even the most well-trained bird can succumb to instinct when scared, flying away to escape a perceived danger. Though clipping her wings is not a substitute for providing a safe environment, it should be done consistently throughout her life. Looking at an extended wing, whether viewing from the parakeet's front or back, you will clip only 4 to 8 of the outermost feathers in the bottom row, starting from the outside in. These primary feathers, which provide forward propulsion, are the largest. Clipping 10 primary feathers is a bit much, and the 11th feather begins the secondaries, which should never be clipped. Avoid the smaller feathers in the next row up, called blood feathers; as their name implies, they contain dark shafts of blood and will bleed. If accidentally cut, apply styptic powder to the wound and let the bird heal before clipping again. Clip the same number of primary feathers on both wings. Keep in mind that window clipping, or leaving the outer two or three feathers intact for appearance's sake, can lead to a false sense of security -- your bird may still be able to fly. Obviously if your parakeet has been flying around to avoid you, her wings need to be clipped. Between clippings, however, it can be difficult to determine when trimming the primary feathers is necessary. A good test is to have her perch on your hand a few feet above a carpeted floor. Lowering your arm suddenly, yet carefully, will cause the bird to flap her wings, and she will either flutter to the floor or glide gracefully away. Parakeets who can glide from one location to another need to have the feathers clipped again. If it's been a while since the last time you clipped your parakeet's wings, and you can clearly see that the long primary feathers have grown back, go ahead and trim them, using the secondary feathers as a guide to how far up the primaries to clip. Baby parakeets must learn to fly before their feathers are clipped so they can develop balance and agility. Of course, you should never clip your parakeet's wings if you don't feel confident that you'll be able to do so quickly and painlessly. Learn how to hold the clipping shears -- never point them toward the bird's body. If you're nervous or your feathered friend is irate or squirming, consider visiting a veterinarian to observe the process by a professional first. 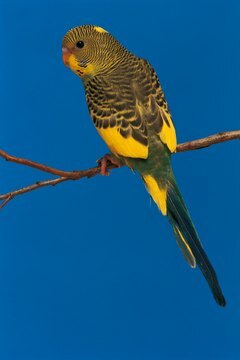 Do Parakeets Still Fly if They Get Their Wings Clipped?